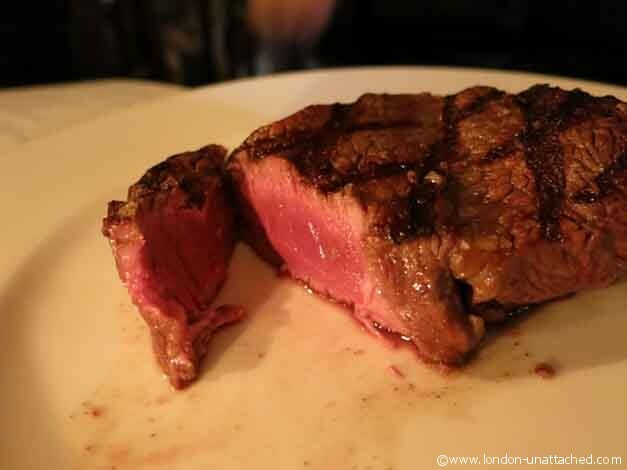 Casa Malevo is the older brother of Zoilo – a fabulous Argentinian restaurant in Marylebone I reviewed when it first opened last year. I was told that the style of cookery at Casa Malevo was quite different – Zoilo is a modern take on Argentinian food while Casa Malevo aims to serve the kind of traditional Argentinian food that might be served at home – if you came from a family of excellent cooks! Curious, I made my way there to be greeted by the very friendly and helpful manager, Roberto. Of course he offered us cocktails and I managed to arm-twist my companion into trying the Sweet Fernando – a cocktail made with Fernet Branca, honey, lime and egg white. I have to say, it’s probably something better suited to a hot Argentinian summer than to a chilly March evening – it was slightly citrusy with alcoholic mint notes but with a bitter taste that perhaps explains why Fernet Branca has few fans in this country. 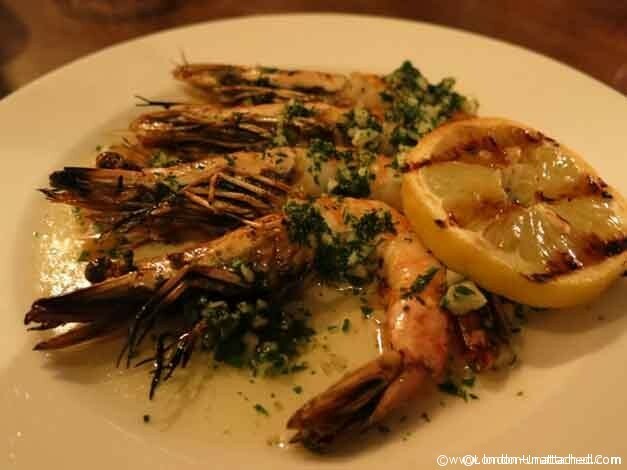 I am genuinely trying to eat a little less meat, so I picked the Garlic Prawns to start although I really craved the Morcillo (black pudding), knowing I’d indulge in a steak for the main course. 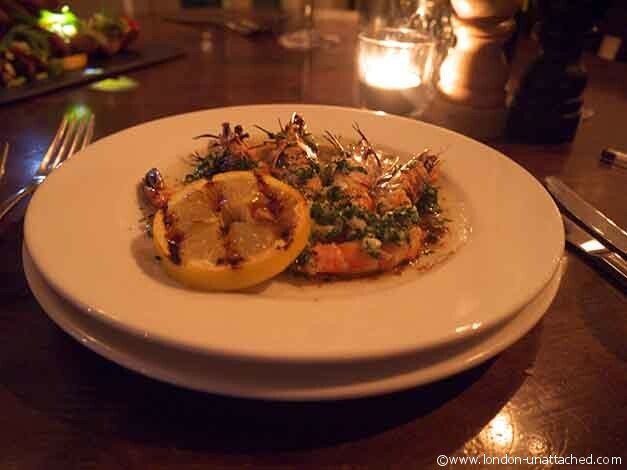 I wasn’t disappointed when a fabulous plate of prawns arrived, beautifully grilled and with a simple garnish of caramelised lemon. In fact, although they look like whole prawns, the outer shell of the body had been removed, so you could eat them just by pulling off heads and tails, without that messy unpeeling exercise. Although, I still managed to create considerable chaos with the buttery sauce. My companion, Simon from By-Invitation, was intrigued by Roberto’s explanation of sweetbreads. 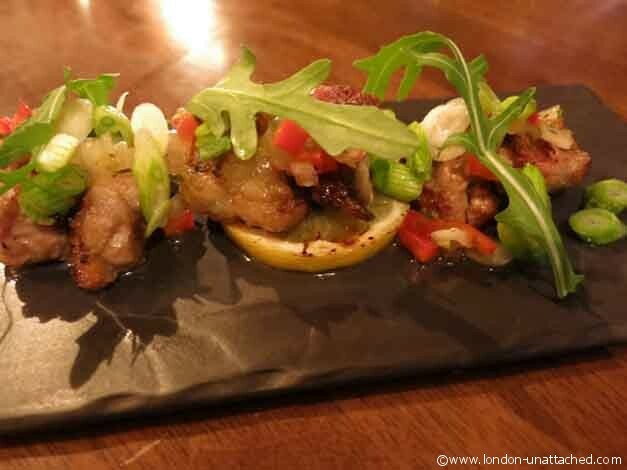 A real delicacy in Argentina, it is regarded as the sign of a good cook to be able to serve the perfect sweetbreads. These were immaculately presented, tiny morsels of meat (sweetbreads are the thymus or pancreas, usually of sheep or calves!). He chose the wine from an excellent list of well priced wines, mostly between £20 and £40. The Argentinian Malbec Decero 2010 was a fine choice and worked very well with the steaks! We picked different cuts deliberately. 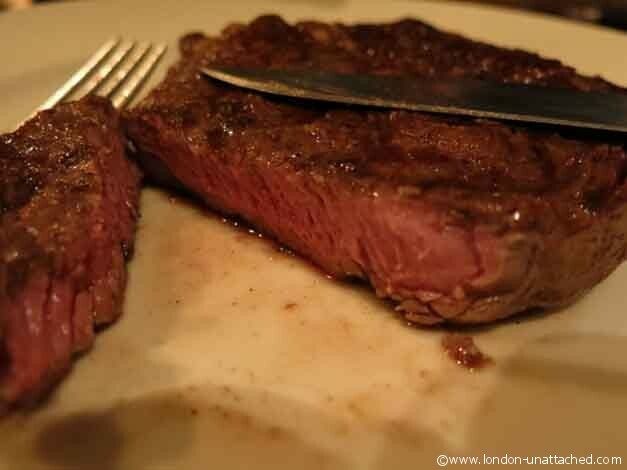 For me, a rare fillet while my companion picked the rib-eye cooked medium rare. 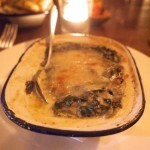 And, sides of chips, creamed spinach and mushrooms. The meat arrived immaculately cooked. I have to say, the fillet was larger than I’ve eaten for a long time, but I managed to finish it without any problems. I even had a taste of the melting rib-eye, which was beautifully flavoured and nicely textured, the sign of good, well aged beef. 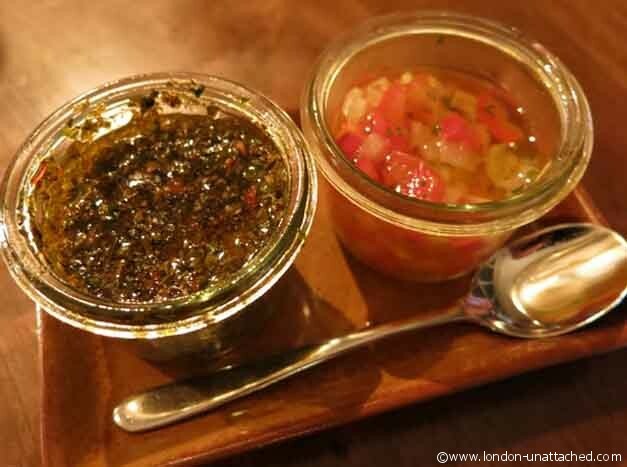 Steaks came with a chimichurri and a finely diced red pepper salsa which are both traditional Argentinian garnishes. And, the side orders were delicious. 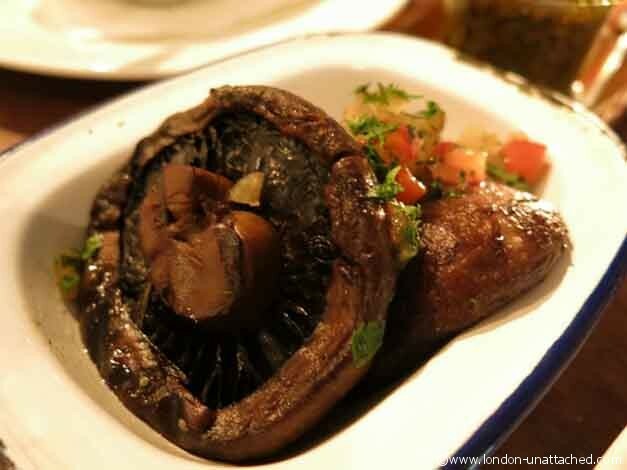 Excellent field mushrooms which had I not been having an evening of being Little Miss Piggy would have been enough in themselves, perfectly crispy chips and a creamed spinach that really didn’t make you think you were enjoying one of your 5 a day. 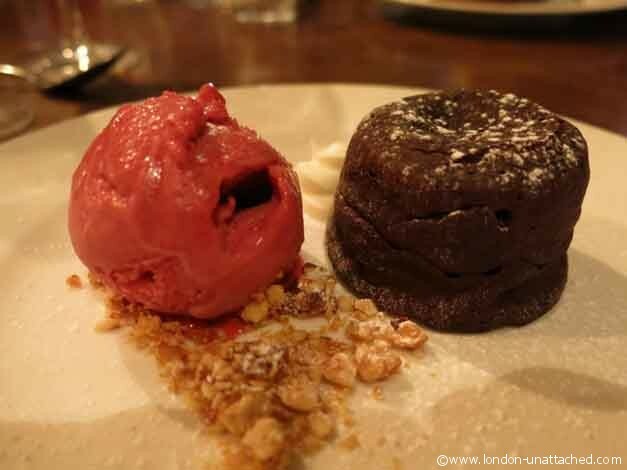 So, after a sybaritic start, I continued in style by finishing the meal with a superb chocolate fondant with raspberry sorbet and hazelnuts. 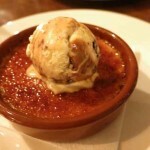 My companion was less convinced by his crème brulee dulce de leche, but I suspect that was simply that he is used to a conventional brulee. 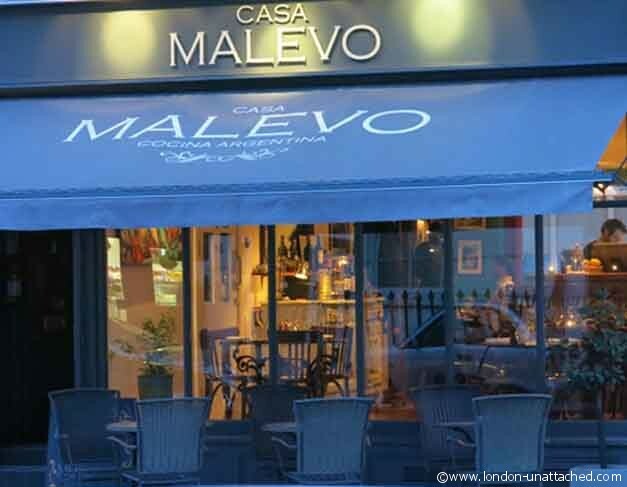 Casa Malevo is a stone’s throw from Hyde Park Corner in Connaught Village but somehow manages to have the intimacy and warmth of a local restaurant. 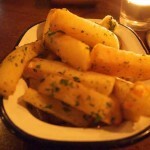 The food is beautifully flavoured , cooked and presented with style while staying simple and unpretentious. 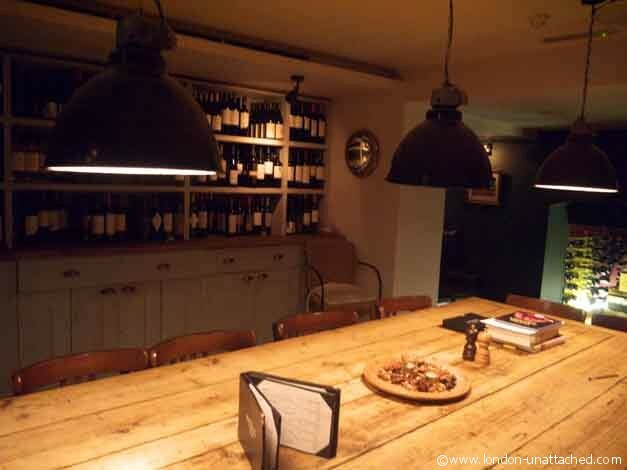 I particularly liked the downstairs private dining room, which could easily have been in someone’s home (if you know someone with an extensive and excellent collection of Argentinian wines). I much prefer pisco sours – which I think are also made with egg white;) but overall it was a great place!